Parsley is a member of the carrot, parsnip and celery family. 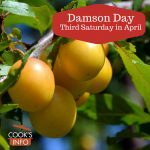 It is often used fresh as a garnish because it looks great, and doesn’t really compete with the taste of anything — especially, perhaps, because it’s left untouched at the side of most dinner plates. Some describe its taste as “grassy.” One assumes they mean rather that its smell is reminiscent sometimes of freshly cut grass, and not that they have actually eaten grass recently to know the taste. 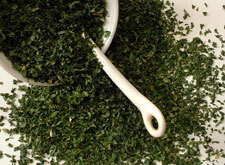 It is the most widely used kitchen herb in North America and in the UK, and most of that is in dried form. It takes 12 pounds (5.5 kg) of fresh Parsley to make 1 pound (450g) of dried. You probably couldn’t count the number of times you’ve seen food writers dismiss dried Parsley as having no taste, but they’re just plain wrong. The thing is, all Parsley fresh or dried, should be added to cooking at the very last minute before serving, in order to maintain its taste and nutritional value, but that’s especially so with dried Parsley as the taste is very subtle. So keep on using your dried Parsley, and three raspberries to the food snobs. What’s important for everyday cooking is being able to have things on hand. 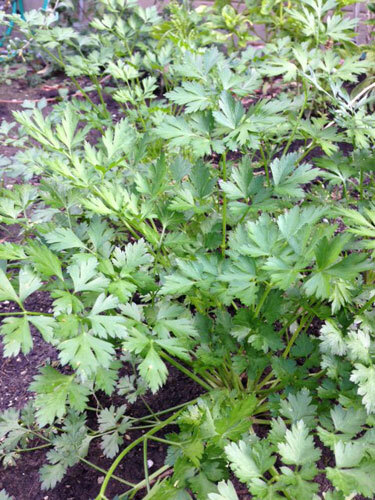 Now, you may be lucky enough to have a place where you can grow Parsley year round outside (it never seems to survive inside in most kitchen windows), but most people don’t. Most food writers seem to want the power to snap their fingers and send everyone from Vancouver to Edinburgh scurrying off to the supermarket on a miserable winter’s night in February for one sprig of fresh Parsley.But having that sprig of fresh Parsley won’t change your life and in fact, may make it more somewhat miserable by the time you’ve made the round-trip schlep for it. Herbs in tubes. Schwartz is now marketing these in the UK; you can get them at Tesco’s, Sainbury’s, Co-op, Somerfield and probably other stores, too. The finely-chopped herbs are preserved in oil in a thick paste, and you just squirt out how much you need. These are a great compromise for those who don’t want to use dried on principle, but are also too sensible to be buying an entire bunch of fresh Parsley that they’ll use 1 sprig of and then throw out. The other debate seems to be between flat / broadleaf (Italian) and curly (English) fresh Parsley. There are foodies who swear the flat has no taste, and foodies who swear the curly has no taste, and the tide swings first in favour of one camp, then in favour of another, depending on the decade. Most people would be very hard pressed indeed to taste a difference between the Parsleys, but if the energy expounded prevents these foodies from making inane comments on other things that discourage everyone else from trying to cook, let them carry on with it. Use whatever you can get, and if you do get a choice, then just decide based on whatever texture you think would work best with what you are making. Parsley will die off in the winter in most places, but if the winter isn’t a severe one, it will grow back in the spring. Otherwise, you need to replant. Always add just at the very end of cooking, as heat destroys both the flavour and the nutrition. Any herb whose taste would be appropriate to what you are making. You see, the thing about Parsley is that its taste doesn’t really influence the taste of anything else in a recipe, which is not true of most other herbs. Try celeriac leaves, if ever you come across them. Good source of Vitamins A and C, iron, potassium, folic acid. Parsley is said to be fatal to small birds, including housebirds such as parrots. 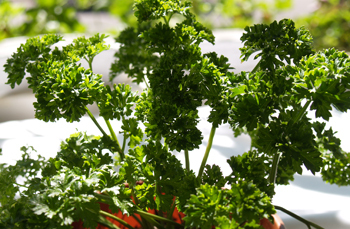 Store fresh Parsley bunches with their stems in a glass of water; doesn’t need to be refrigerated, should last for about 5 days. To freeze, just wash, chop and toss into freezer bag and freeze. Just before completely frozen, scrunch the bag so that it doesn’t freeze as one huge solid block. Or pack into ice cube trays, flood the tops of the cubes with water, freeze and when frozen, pop out of the ice cube trays into freezer bags. To dry Parsley, you can’t just hang it up to dry as it will just end up looking and smelling like old straw. 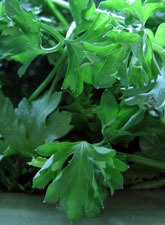 Wash the Parsley, shake off all the water, snip off any tough stems, cut into small bunches. Then you can dry either in microwave or in conventional oven. For microwaving, do a few small bunches at a time. Place between two paper towels, and zap them on high for 2 minutes. If the Parsley doesn’t seem dry and crumbly, then continue zapping for 30 second sessions until it is. Let cool and bottle. Or, preheat a regular oven to 250 F (120 C), then turn heat off, place Parsley on a tray in the oven and close the door, turn a few times while any heat remains in the oven. When you cost in your time, though, and the energy you’ve just had to pay for, you’re probably just as well off to buy it already dried. The Greeks used Parsley medicinally. They were growing it as early as 300 BC. Greek legend said it grew from the blood of heroes. They made crowns of it for their sportsmen, and fed it to chariot horses. But, they never used it as flavouring in food. Brought to Americas in 1600s by the English. “And all around soft meadows bloomed of violets and Parsley.” — Homer, The Odyssey, circa 850 BC, Butcher & Lang translation. There was a belief during the Middle Ages that you could do someone in by speaking their name while pulling off a sprig of Parsley. Now, there are some stores with nasty vegetable department managers where you could get yourself done in doing that. Some say a sprig of Parsley is a natural freshener for breath with the odour of garlic or onion on it. The truth of the matter is, it doesn’t make any huge great improvement, not like a gulp of mouthwash would, and you’d have to be really close for a little sprig to make any discernible difference. Starting from the Latin, here are the contortions the word went through to become our word English Parsley today: petroselinum, petrocilium, petersylinge, persele, persely, Parsley. The flat-leafed Italian variety is “Petroselinum crispum var. neapolitanum”.